Phoebe Flyby - Universe Galaxies And Stars Section. Cassini Makes its Phoebe Flyby. NASA's Cassini Spacecraft: Image credit: NASA/JPL/Space Science Institute. NASA's Cassini spacecraft made its first close encounter with the Saturnian system on June 11 when it swept past Phoebe. The spacecraft got as close as 2,000 km (1,240 miles) to the small moon, and saw incredible details on its smashed up surface. The evidence is starting to show that Phoebe may be an ice-rich body coated with a thin layer of dark material. Instruments on board Cassini will measure the moon's density to get a better sense about how much of it is composed of ice. Cassini will reach Saturn on June 30. Phoebe’s true nature is revealed in startling clarity in this mosaic of two images taken during Cassini’s flyby on June 11, 2004. The image shows evidence for the emerging view that Phoebe may be an ice-rich body coated with a thin layer of dark material. Small bright craters in the image are probably fairly young features. This phenomenon has been observed on other icy satellites, such as Ganymede at Jupiter. 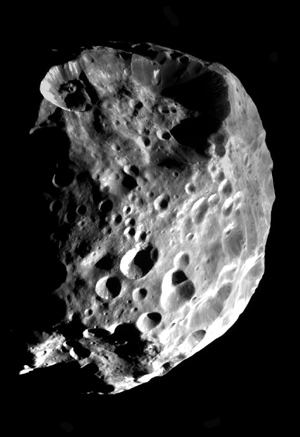 When impactors slammed into the surface of Phoebe, the collisions excavated fresh, bright material - probably ice - underlying the surface layer. Further evidence for this can be seen on some crater walls where the darker material appears to have slid downwards, exposing more light-colored material. Some areas of the image that are particularly bright – especially near lower right – are over-exposed. An accurate determination of Phoebe’s density – a forthcoming result from the flyby – will help Cassini mission scientists understand how much of the little Moon is comprised of ices.